When putting our address into a GPS, Google maps takes you onto Upsndowns Road which is a private closed Road. You need to turn at Balnarring Road, Not Upsndowns. It is best to directly advise your guests on how to get there & include a map in your invitations. Get onto the Eastlink Fwy, head South and take the Exit towards Frankston. Turn off the Eastlink at the Peninsula Link towards Sorrento/Portsea. Get off the Peninsula Link at the Balnarring Exit. Turn left at the exit roundabout onto Old Moorooduc Rd. Turn Left at the next road, Balnarring Road (There is a sign to Tanglewood). The first right is Foxeys Road. Turn here and follow it all the way around, it turns into Bulldog Creek Road. 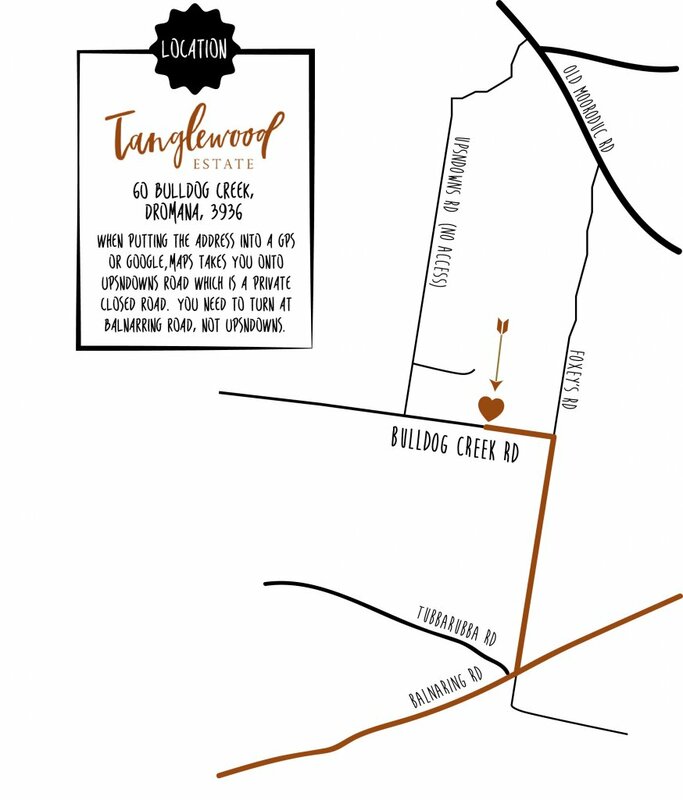 Tanglewood Estate is on the right hand side.